SW3G-44USF-4UCB is a 10 Gigabit Carrier Ethernet switch with Layer 3 routing protocols for Gigabit access, aggregation and distribution functions from 4x 10 Gigabit Ethernet up-link interfaces. It delivers 44x 100/1000 optical SFP and 4x RJ45 / SFP combo Gigabit Ethernet ports. It enables Provider Bridge / Double Tag VLAN, G.8032 and 802.3ah OAM maintenance functions at the edge of a Carrier Ethernet network. 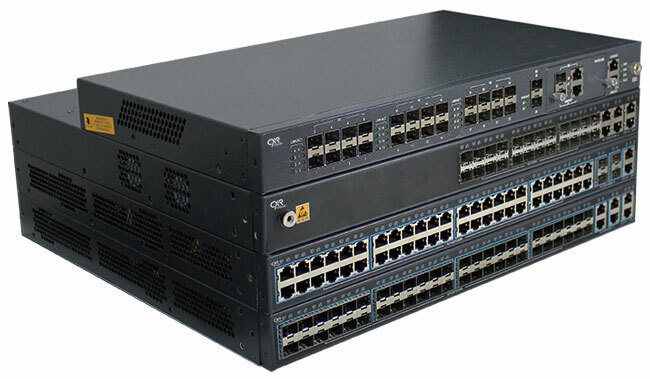 Its high performance and Layer 2/3 switching capabilities, its rich set of protocols and security functions, make it a new generation equipment for the most stringent requirements of the corporate and industry networks. It embeds OSPF and BGP for routing as well as VRRP router redundancy protocols. SW3G-44USF-4UCB comes in a 19''/1U chassis with two slots for redundant power supply cards with 110-230 Vac and 48 Vdc input options. Two up-link slots can receive dual Ethernet ports with Gigabit or 10 Gigabit options which deliver a total capacity of 88 Gigabit. SW3G-44USF-4UCB is a highly reliable industrial design which is part of a comprehensive range of 10GE products with a choice of 24 or 48 RJ45 and SFP port options.